Now that Windows 7 is being met with mostly positive reviews and green-lighting by software professionals, no doubt many will be making the switch to Microsoft’s new operating system in the next couple of weeks. Which is a bit of a pain if you stuck with Windows XP and skipped Vista altogether, because then the best thing for you to do is perform a complete clean install after backing up your data and programs. Wiping out your data is one thing, but you’ll also need to install all your applications from scratch again once you get Windows 7 up and running on your computer. The same goes, of course, for people who buy a new PC and start with only a few pre-installed programs – or none at all. Installing multiple software applications can be quite a painstaking, time-consuming chore, but a Y Combinator -funded startup has just pushed a tool that aims to make the process very, very easy. And free of charge on top of that. 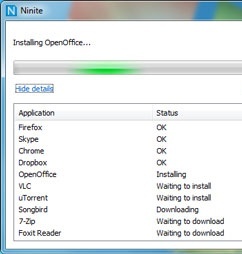 Meet Ninite, a multi-app installer tool that’s as useful as it is simple. 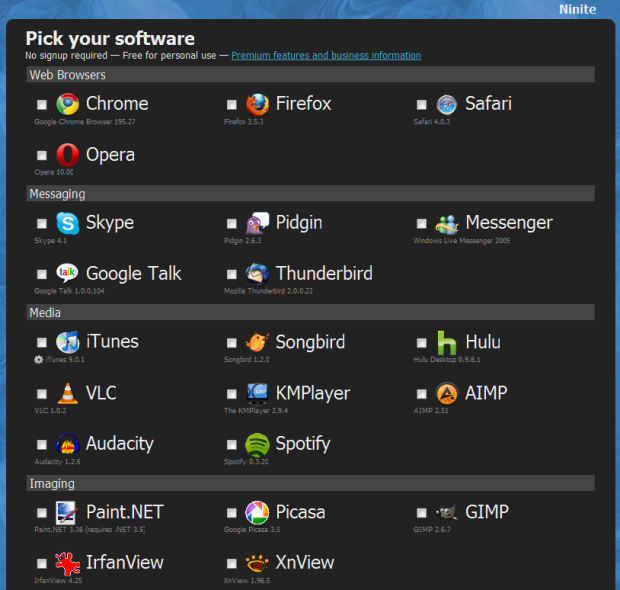 Ninite has aggregated a bunch of popular PC applications in a range of categories on its website, and allows you to check multiple software programs and run the setup process for each of them in one go. No installation of additional software required, and Ninite will even automatically refrain from including toolbars and whatnot with the software you’ve opted to install. The only disadvantage I can see is actually a feature: default settings for software programs you’ve chosen to install will automatically be selected, so there’s little customization you can perform during the set-up process. Once you’ve selected all the apps you want, you’ll get a single executable file which will run all installations in one go while you go have an espresso. Ninite, which was called Volery while in private beta, is a product from Secure by Design, a YC-funded startup which discovered people were yearning for this type of tool when marketing the BaseShield App Store, essentially an app store for Windows apps. The company aims to make money off Ninite by offering premium features like local download caching, network share download caching and a silent mode to paying users.